My research into the ultimate keyboard for my secondary workstation continues! So far we’ve looked at the Unicomp Spacesaver M bucking spring keyboard, which is the Mac version of the Spacesaver I already have. Speaking of StackExchange, Jeff Atwood surprised peripheral nerds last year with the announcement of his CODE keyboard. In a refreshingly humble blog post, Jeff explained what motivated him to create his own slab of programming goodness, along with some design justifications. It was an interesting read, and obviously written by someone passionate about his craft. 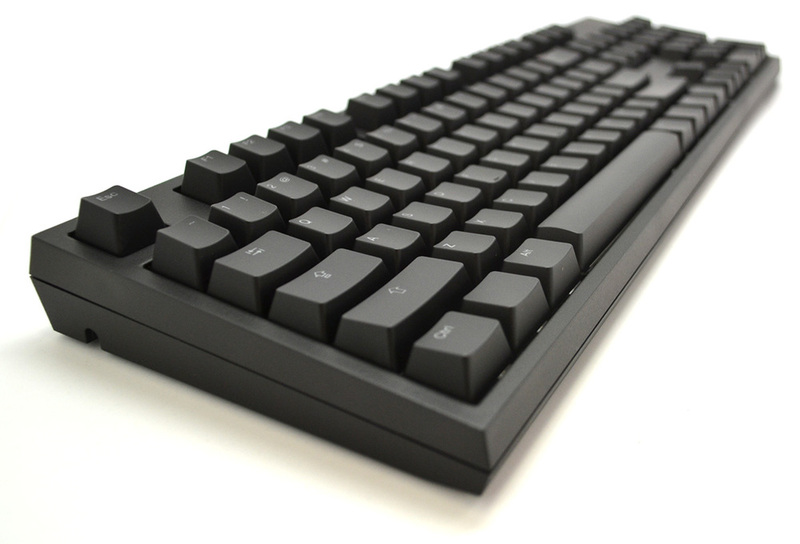 The keyboard is manufactured by WASD Keyboards, so named for the key arrangement preferred by DOS gamers everywhere. I’ll admit, I was one of the few who hadn’t heard of WASD prior to the introduction of the CODE; if this was a marketing exercise it worked. The CODE uses Cherry MX mechanical switches. Anything other than buckling springs will be a compromise in my book, but testing existing Cherry MX keyboards in stores yielded a pleasant experience. They lack the reassuring, mechanical “sharpness” I’m used to, but they still offer far more responsiveness than gross, mushy membranes. The CODE use Cherry MX Clear or Green switches with “sound dampening O-rings”. I’ll most likely be writing a whole obsessive post about these switches, but suffice to say the Greens are somewhat stiffer. I’ll be using this keyboard in the loungeroom of our house, so I’m willing to chalk up their quieter operation as a practical plus. Speaking of switches, the CODE holds DIP switches on the back to control all manner of operations. Most appealing to me is assigning assigning CAPS LOCK to CONTROL, a favourite of all rational typists who long since made the SHIFT key their friend. In terms of physical design, the black bezel and keys are dull with a side of conventional, though the texture promises to avoid fingerprints. I never thought this an issue till I started typing regularly on a MacBook Air for extended periods! Speaking of practical considerations, the 87 key option looks wonderful. Virtually all smaller keyboards sacrifice the PigUp/PigDown and cursor key islands along with the numeric keypad, including Apple’s bluetooth model. The CODE comes with the option just to sacrifice the numeric keypad. Ipso facto, no awkward shoehorning of PigUp/PigDown, Insert and the like into weird places. Unfortunately, there are some personal tradeoffs. I don’t want or need a backlight, so paying a premium it seems redundant. It’s plain black. It also sports one of those terrifyingly horrible micro-USB plugs which all need to jump into a volcano and be melted down into something usable. The layout is clearly for PCs, but the aforementioned DIP switches can remap the Windows/Alt keys to Command/Option. I’ve been using a Unicomp PC keyboard with a Mac for years, so that doesn’t really bother me. For situations where I need to boot into Linux or *BSD, having a more standard layout is also a plus. Micro USB aside (#facepalm) this keyboard is intriguing. It’s opinionated hardware for Jeff Atwood, and I appreciate that. For the relatively steep price though, I’d rather one that didn’t make as many personal compromises. Fortunately, this keyboard introduced me to WASD Keyboards, which has some wonderful looking kit and may satisfy all my pickyness. The search continues. Newer post ← #KyaryPamyuPamyu in Sydney!